An attractive 19th century map of the West Indies. 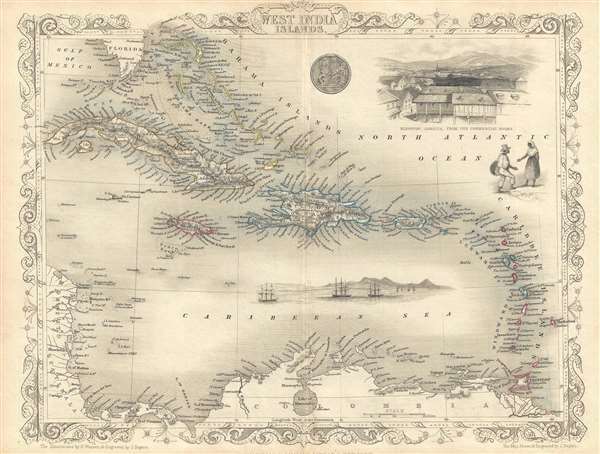 This is an 1851 John Tallis map of the Caribbean or West Indies. The map depicts the region from Cuba and the Caribbean coast of Central America to Barbados and from southern Florida to Colombia and the mouth of the Orinoco River. Each of the islands of the Greater and Lesser Antilles are labeled, including Cuba, Santo Domingo (Hispaniola / Hayti), Puerto Rico (Porto Rico), the Virgin Islands, Guadeloupe, Martinique, and St. Lucia. The Bahamas and the Turks and Caicos Islands are also illustrated and stretch from Florida to Santo Domingo. Highly detailed, myriad locations throughout the region are labeled, particularly along the coastlines of Cuba, Santo Domingo, Puerto Rico, and Jamaica. Small islands along the coast of Central America are also identified. A view of Kingston, Jamaica, is situated in the upper-right corner, along with a vignette of two Islanders. A vignette included in the Caribbean Sea depicts numerous large sailing ships with three masts, possibly ships-of-the-line, sailing toward an island. This map was engraved by John Rapkin and published by John Tallis in 1851 as part of series of maps created for his Illustrated Atlas. John Tallis (November 7, 1817 - June 3, 1876) was an English map publisher and bookseller. Born in Stourbridge in Worcestershire, worked in his father's Birmingham agency from 1836 until 1842. Roughly in 1838, Tallis published a collection of London Street Views, and entered into a partnership with his brother Frederick Tallis from 1842 - 1849. Tallis and Company also published the Illustrated Atlas of the World in 1849. Also in 1849, Tallis traveled to New York City where he founded publishing agencies in six American cities. Upon returning from New York, Tallis paid his brother £10,000 for his share of the business, and operated from then on as John Tallis and Company until 1854. By 1853, John Tallis and Company had agencies in twenty-six cities in the United Kingdom, the United States, and Canada and employed over 500 people. By the end of 1853, Tallis had made the decision to share the burden of running such an extensive company and formed the London Printing and Publishing Company on February 24, 1854, becoming co-managing director with Ephraim Tipton Brain. After a series of setbacks, however, Tallis had to sell his estate and by 1861 was declared bankrupt. He was kept afloat by the kindness of friends and former employees, but none of his 'various ambitious projects' ever worked out for the rest of his life. Tallis married Jane Ball on December 6, 1836 in Birmingham, with whom he lived until her death in 1862. Tallis remarried on June 27, 1863 to Mary Stephens, with whom he had two children. John Rapkin (July 18, 1813 - June 20, 1899) was an English mapmaker and engraver. Born in Southwark, Rapkin was the son of George Rapkin, a shoemaker, and his wife Elizabeth Harfy. Rapkin and his brother Richard both became engravers and his other brother, William Harfy Rapkin, became a copperplate printer. Rapkin produced works for James Wyld and John Tallis, including The United States and the relative position of Oregon and Texas for Wyld around 1845, and a series of eighty maps for Tallis that became 'Tallis's illustrated atlas, and modern history of the world' in 1851. Rapkin married Frances Wilmot Rudell on January 4, 1837, with whom he had at least eight children, some of whom became engravers, including his sons John Benjamin Rapkin (1837 - 1914), Alfred Thomas Rapkin (1841 - 1905), Joseph Clarke Rapkin (1846? - 1912), and Frederick William Rapkin (1859 - 1945). Rapkin operated under the imprint 'John Rapkin and Sons from 1867 until 1883, and was operating as 'John Rapkin and Sons' by 1887. Rapkin died in 1899 at the age of 85 soon after the death of his wife of over sixty years. Very good. Even overall toning. Wear along original centerfold. Verso repair to centerfold separation. Publishers imprint partially cut off along bottom border. Blank on verso.